The biggest international skydive event of the Benelux! The ISR Grand Prix is ​​an annual event for skydivers in the FS4 and D2W discipline. With an international character, teams from all over the world come to Roosendaal to visit this event. We are absolutely proud of that! This year the ISR Grand Prix is ​​organized for the 8th time! When is the ISR Grand Prix? Every year, the ISR GP is organized on the last Saturday of November. The next edition is on November 25, 2017. The event is for all categories within the FS4 skydiving: AAA-AA-A-Rookie and D2W, and licenced as Dutch Championship. 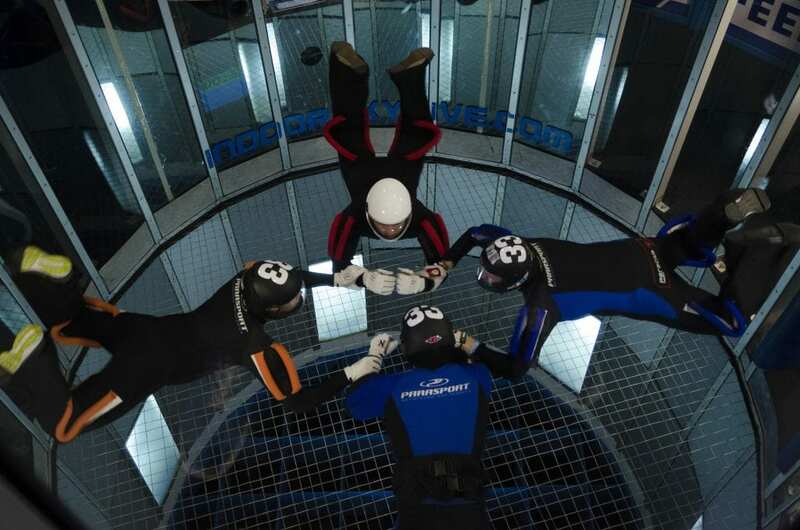 The indoor skydive scene is growing enormously. It’s no longer a sport only for the pro’s, but everyone can skydive indoors. First timers get the opportunity to learn from frequent flyers and that makes the sport so beautiful. The annual return of the ISR Grand Prix contributes to this. We see the event growing a year and just the accessibility is appreciated! In spite of competition, skydivers learn from each other and make fun out of it! Teams from all over the world come especially for the ISR Grand Prix to Roosendaal. The meeting place for skydivers! Subscribe your team for ISR Grand Prix 2017! Yes, we want to join!